Eco-friendly and adorable, cupcake cones eliminate the need for crinkly paper wrappers. 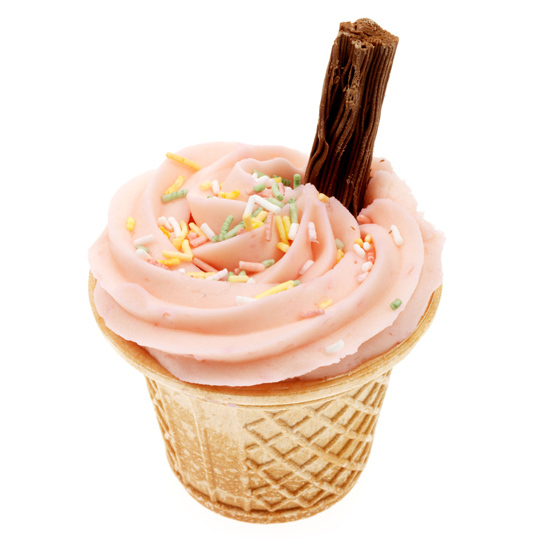 Instead, the mini cakes are baked in flat-bottomed ice cream cones and then frosted to look like a lickable scoops of ice cream. The exact origins of the cupcake cone (or cupcone) are unknown, but the handy dessert can be traced back to at least 1957, when it appeared in a Betty Crocker advertisement. More than 15 years before Dominque Ansel blew customers’ minds by blurring the lines between a croissant and a doughnut, City Bakery started selling a croissant crossed with a pretzel. According to the New York Times, the salty, buttery pastry was birthed when Sandra Nieve, a pretzel baker renting space in City Bakery, dipped a croissant into the lye solution she used to give her pretzels their sheen. She baked it, dusted it with salt and sesame seeds, and a pastry star was born. 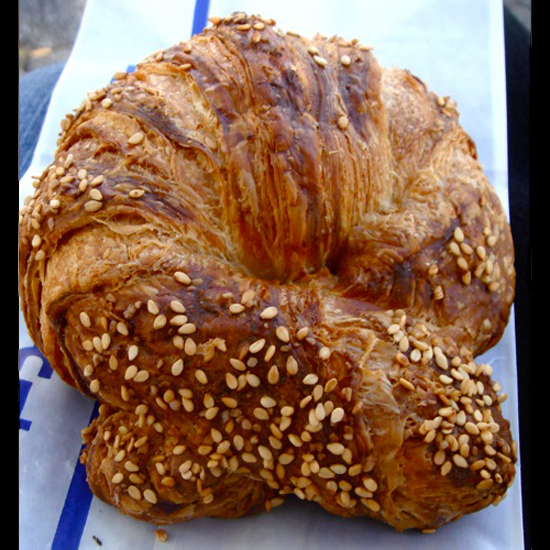 Today, the pretzel-croissant even has its own website and devoted followers include Parker Posey, who is still waiting for them to do a version filled with chocolate. 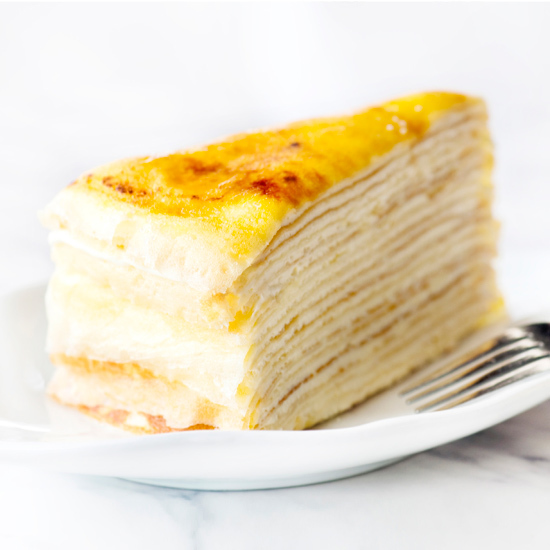 In 2004, Lady M Cake Boutique’s ethereal cake made of 20-plus crêpes layered with pastry cream and finished with a crispy brûléed topping became a favorite in New York when the confectioner opened its first stand-alone shop (previously, the cakes had been available only at Takashimaya and Dean & DeLuca). Not long after, in 2005, Amanda Hesser deemed it the city’s “second best cake”). Lady M has since expanded upon its classic vanilla recipe (which remains a trade secret) to flavors ranging from chocolate-banana to green tea. The fact that Lady M is still growing (a new location recently across from Bryant Park) is evidence of the confection’s enduring appeal. These easy-to-eat spheres are everywhere: weddings, Godiva shops, even Jean-Georges Vongerichten’s ABC Kitchen makes an über-chocolaty version of the trendy dessert. 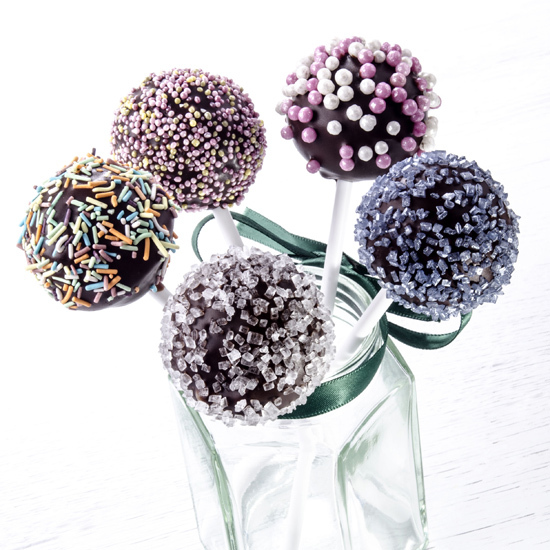 The mother of cake pops is Angie Dudley, a.k.a. Bakerella, a blogger whose January 2008 post about red velvet cake balls on a stick set off the craze. Dudley made a career out of the post: She appeared on The Martha Stewart Show, wrote a cake pops cookbook and created a cake pop kit. 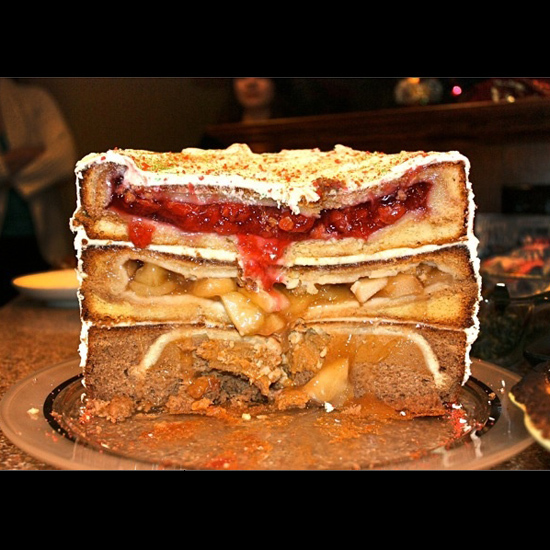 The turducken of the dessert world, a cherpumple consists of three pies (cherry, pumpkin and apple) that are each baked in cakes (spice for the apple, yellow for the pumpkin and white for the cherry) and stacked to make one monster of a dessert. It was first created by Charles Phoenix—a humorist, author and self-described “ambassador of Americana”—in November 2009 after he noticed that his family members refused to have just one type of pie at Thanksgiving, and instead took a slice of each of the three pies he made. He decided to make it easier for them by creating one giant dessert that combined them all. Phoenix and the cherpumple found fame in a YouTube video that shows the making of the massive cake. If you love pancakes but hate that they’re flat, Dinkies are for you. The cake ball-pancake hybrid comes from a store (also called Dinkies) in New York City’s Chinatown. Named for their diminutive size, the fluffy spheres are similar to Danish aebleskivers, but are set apart by their wide range of flavors. 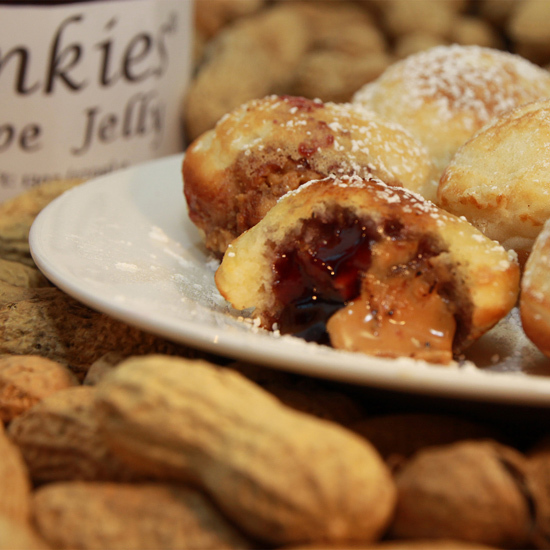 Rather than simply served plain or dusted with powdered sugar, Dinkies come in both savory and sweet flavors ranging from chocolate chip to ham and cheese to strawberry shortcake, and can be topped with a range of sauces and add-ons like malt balls and cookie dough. 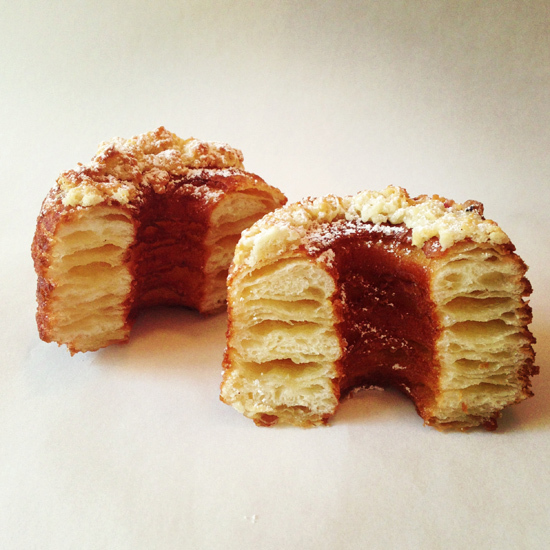 Half croissant, half doughnut and 100 percent an Internet phenomenon, Dominique Ansel’s cronut dropped in May. Chef Ansel, who sells the cronuts at his Soho bakery, began by making just one batch of 50, but three days later he sold out 200 by 9:30 a.m.—just an hour and a half after opening. The cronut’s popularity reached absurd levels when cronut scalpers began popping up on Craigslist, offering to deliver a single cronut for $100 (at the bakery they sell for $5). To make the obsession-worthy pastries, Ansel deep-fries buttery croissant dough that has been layered and cut to resemble a doughnut, then rolls it in sugar, fills it with cream and glazes the confection. The original flavor was rose; now up: blackberry cream.